The first room I want to share my newest splurge vs. saves series is our kitchen. A little over a year ago, Trent and I moved out of our house for a few months and remodeled most of it. One of my favorite spaces was the kitchen, you can read more about that here. There were certain items I knew I wanted to have, but remodeling a whole house at once doesn't leave a ton of wiggle room in the budget, so to make both Trent and I happy, we saved where we could and I love it all so much! 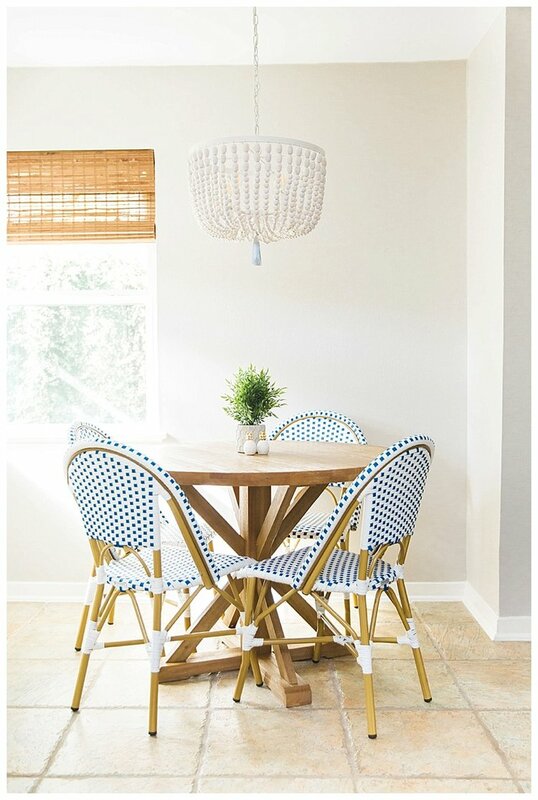 For as long as I was picturing our new kitchen, I wanted these Serena & Lily Bistro Chairs. I knew with remodeling our whole home at once, there were some things I wasn't going to be able to splurge on. I was so excited when I came across these chairs. A pair of them is less than the price of the original ones I wanted- what a deal! I love mixing traditional pieces and more modern together. I like the farmhouse style but didn't want to over do that either. I found the perfect wooden breakfast table. The color is light and pulls everything together naturally. I saw so many splurges before finding this awesome steal. We needed some statement lighting pieces in two spots of our kitchen, one over the breakfast table and one over the island/ bar area. I knew I wanted something bold but also something that would not go out of style. I love the beaded chandelier look. I first found this beautiful chandelier and after a quick google search, I found almost the exact one at a fraction of the price. The pendants over the bar were one of my favorite things we put in our kitchen. I didn't want the view into our kitchen blocked in anyway after opening it up so these were perfect. I modeled them off of a few lights I had seen browsing the internet but was able to find another steal. Trent and I love sitting at the bar for dinner when it's just the two of us (and Piper is down for the night!). I found these super comfy and cute bar stools. I love the nailheads in them and the tailored look for half the price of the fancy ones! We have some open shelves so I was able to find things that I wanted to be displayed all of the time. I knew this area would change with the season or how I was feeling so I needed pieces that made me feel okay about switching them out! I got these drinking glasses that came in a set of 4 and reminded me so much of other vintage ones I had fallen in love with. I love the traditional blue and white pieces people are putting in their homes. I found these bowls that came in a set of four to add some pops of color to our shelves. 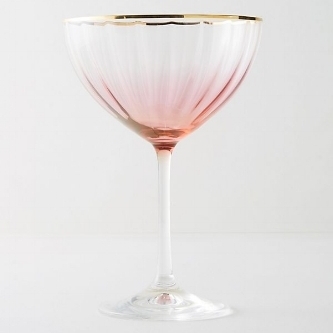 I was able to mimic these Anthropologie martini glasses with these adorable ones from World Market. How cute are these pineapple salt & pepper shakers? These had an even better price tag! I loved this retro toaster because it reminds me of our oven that is original to the house, but got this one for a fourth of the price! 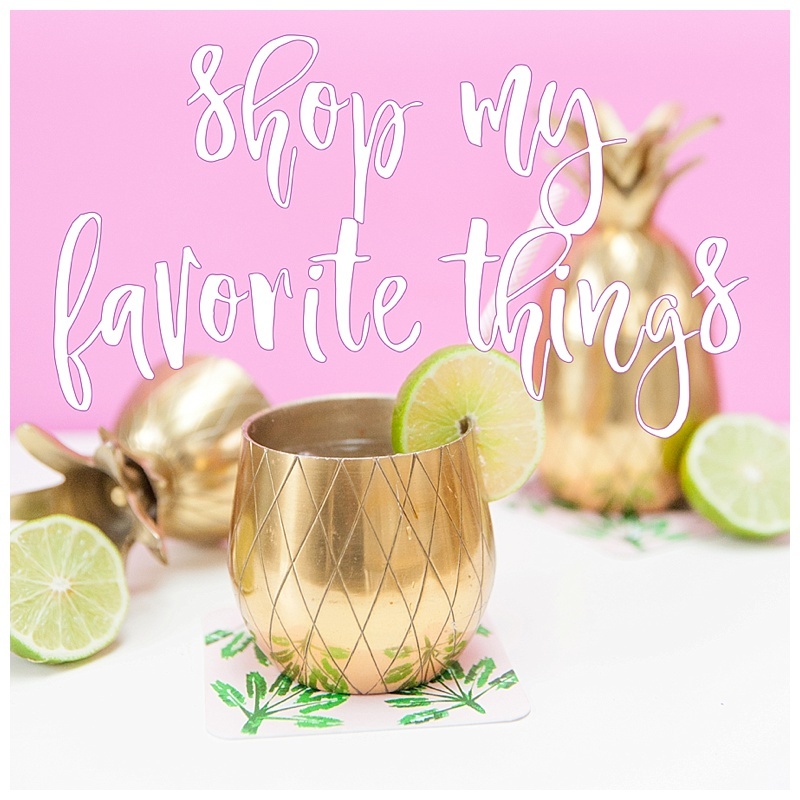 Because we decided to splurge on the remodel in our kitchen, I was happy to shop for accessories on a budget.